Cheerleaders of the world unite! We need you. Cheerleaders bring color and energy into the world. Without them, the rest of us would be a bit more drab, a bit less fun. The ancient Greek, Hippocrates called them Sanguine and sanguine means blood, or a blood red color. Our blood carries the oxygen that fuels our bodies. Just like our blood, sanguine people bring energy wherever they go. Sometimes a LOT of energy. Sticking with our sports team example, Cheerleaders are the perfect model of a Sanguine and because that is easier to spell, we refer to Sanguines as Cheerleaders. On our personality chart (which you can see by clicking here), Cheerleaders are in the upper left hand corner, high on the vertical energy scale and way over to the left on the horizontal people orientated scale. Cheerleaders love a party. They are enthusiastic about everything and can see the bright side of any situation. They live lives full of color and optimism, charm and charisma. It is the sworn duty of every Cheerleader to cheer up anyone they think is feeling down. One of their greatest strengths is the ability to see the world with the innocence of a child, boiling even the most perplexing problem down to the simple facts. While some may see this as gullibility, or even simple mindedness, it is truly a gift. Cheerleaders don’t get too upset by trials in life for very long. They can be true drama queens when there is an audience, but they get over it quickly. They don’t spend much time dwelling on what ifs. Cheerleaders pick themselves up and are off to the next adventure with a speed that can leave the other temperaments wondering if Cheerleaders even live in the real world. One of my favorite Cheerleaders is Courtney. She was on the school playground with other kids helping to build a snow fort one day when I was on recess duty. Courtney really didn’t care what they were building, she was in it for the fun of being with others. Before too long another group of kids came over and decided it would be cool to destroy the fort. Since they were bigger than Courtney’s group of builders, they did kick down the whole structure that had taken a full 2 days of recesses to build. The reactions of the various kids were revealing. Some ran to me, the teacher on duty. After all, they had been wronged and since they were Manager types, they would not stand for anything that was not right and fair. A couple of the kids stood up to the wrecking crew and gave them a verbal what for. As Coach personalities, they were not going to put up with anyone who tried to change their plans. The Team Players quietly stood back and observed, watching and remembering what everyone else did. But Courtney, our full blooded Cheerleader, just shrugged her shoulders, hugged a Team Player friend who was crying, and enthusiastically started a snowball fight, right then and there. Some of the other kids couldn’t understand her reaction. The Coaches had spent the hours they weren’t on the playground, formulating their strategy for using that fort as a base from where they were going to rule the playground. The Managers put a lot of time and effort into designing exactly how the fort should look, figuring out how much water to add so the snow would be just right for packing and worrying about the chances of a rainstorm coming up and washing all their hard work away. Courtney’s attitude was more than some of them could grasp. How could she be so uncaring about all their hard work? How could she be so disloyal to their team? Courtney’s intention was not to be disloyal and she certainly did care. She cares about people, though, not about things. She took one look at the situation, decided it wasn’t worth getting upset about and moved on to something more fun. Now, snowball fights were forbidden on the playground. Too rough, someone in authority decided, too many chances for kids to get hurt. Courtney knew the rules, but her sense of fun and her desire to lighten up the situation, over-rode any thought of rules. Actually, she didn’t even consider that there was a rule about snowball fights. It seemed to be the right thing to do at the time and she went for it, full blast. If ever there was a perfect example of a Cheerleader, Courtney is it. 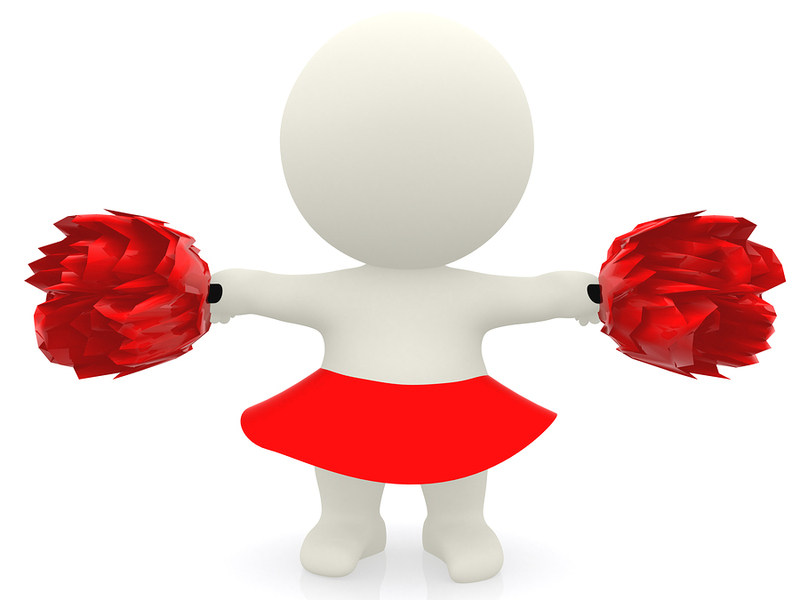 Like all the personalities, the tendency toward being a Cheerleader shows up from childhood. Cheerleaders will walk early because they are so intent on getting someplace new. They laugh easily and often and are usually the ones in the principal’s office right from kindergarten age, in trouble again for talking too much. As they grow, they become cheerleaders for the sports teams, photographers for the school newspaper and the first one to volunteer to run a fundraiser for homeless children. As I was typing this, I glanced at my tea cup and saw this little quote on the tag of my tea bag: “our intuition lies in our innocence.” Cheerleaders have intuition in bucket loads. With their open hearts and childlike faith that all will work out, their hunches and insights about the world around them are worth listening to. Cheerleader moms are the most fun moms of all. Need a unique Halloween custom? She’ll stay up until 2am the night before making one for you. Want someone to chaperone 15 cub scouts to the fire station? She’ll do it and make it a grand time for everyone – especially when she accidentally hits the switch for the firetruck siren and then can’t figure out how to turn it off. She handles upsets like that with aplomb and has the ability to charm the frazzled fire chief when it’s all over. Cheerleaders are charming and charismatic. People love to be around them. If you walk into a crowded room and see a group clustered around an animated talker, you can be sure that person is a Cheerleader. Because their corner of the personality chart adjoins Team Players and Coaches, Cheerleaders can draw on the strengths of both those types. They can organize a party with ease (although they don’t worry about details) and they have the skills of a Team Player when it comes to making everyone feel welcome. And off she goes on a tangent. I’ve learned from experience that when Michelle plans to throw a party, the best thing I can do is try to gently bring her back on track and help her think of all the things that she might need. Usually before the party is over, someone (usually husband Kyle) has made a trip or two, or three, to the convenience store to pick up the items Michelle forgot. But no one cares because we’re all having such a good time. She never did get back to cleaning the garage, by the way. This is a good example of why we need each other, and how we can, by understanding personality differences, learn to work better together. We apply our strengths and rely on others to fill in for our weaknesses. If I were to throw a party, since I’m more Coach personality, the organizing and details are easy for me. I would be wise, however, to enlist Michelle as the idea person. Given a crowd, Cheerleaders will generate the fun. With her natural enthusiasm and zest for life, she can turn my boring get together into an event. This works best when we are willing to be a bit forgiving of the weaknesses of other personalities and open to cooperation. Cooperation comes more easily to Cheerleaders and Team Players. Coaches and Managers much prefer things to be done their way or not at all. By letting go of my need for everything to be my way and “perfect”, and letting Michelle run with her ideas, the end result will be better for everyone. A self aware Cheerleader who knows her personality weaknesses would be relieved of the burden of dealing with details by enlisting her Manager friend to coordinate the supplying of her party. Since Managers like to be needed in this way, it is a win/win situation for everyone. I know it’s hard for Cheerleaders to believe this, but some people actually like making lists! Speaking of list making: Cheerleaders do tend to lapse a bit in their organizational skills. While there is no need to be a perfectionist, some attention to detail is necessary to keep life running smoothly. Every Cheerleader has at some point or another missed an appointment that they forgot about. They are sure they’ll remember it, so why bother writing it down? Day planners can feel like a ball and chain. Cheerleaders love the idea of being organized, they’ll even attempt to implement an organizational system in their life. It seemed like a good idea at the time. But by the time they’ve spent the grocery money on a fancy planner and a few more bucks on the audio seminar that tells them how to use it, they’ve given up on the whole idea because it seems way too overwhelming. Start small and simple. Get a regular wall calendar and a pack of colored dot stickers or colored markers. Cheerleaders are creative and love color! When making an appointment, go over to the calendar and slap a red sticker on the date and use a favorite color marker to make a note of the time and place of the appointment. Make sure the calendar is hanging some place where it can be seen every day. Mine is on the wall beside the door to outside. I can’t leave the house without seeing that calendar sitting right at eye level. I’ve even been known to put a purple sticky note on my car dashboard if I knew I was going to have a very busy day of errands and there was something I must not forget. Organizing doesn’t have to be complex or unwieldy. Fun colors and simple systems will make a world of difference. A word about personality weaknesses. We all have them, no one is perfect. However, knowing our personality weaknesses is not an excuse to accept them or worse, flaunt them. A Cheerleader, using personality as an excuse, might try to pull a: “you have to forgive me for being irresponsible, it’s just my personality” kind of attitude, and it is not okay. We are responsible for becoming the best we can be. Jesus was a perfect blend of all the personalities and He is to be our example. Cheerleaders will never be as good with details and logical thinking as a Manager, but that doesn’t mean they can’t work to improve. On the other hand, Cheerleaders were not created to be like a Manager so they shouldn’t strive to be something They are not. Carrie was born a full Cheerleaders to two very Manager parents. Dad is a professor of linguistics and Mom is an accountant. They are both very precise and deliberate in everything they do. From the moment she could walk and talk, the words Carrie heard most frequently were: “sit down and be quiet”. She firmly believed she lacked a self control gene because everything she did was seen as too boisterous, too noisy or too impetuous for her orderly parents. Mom and Dad had her entire educational career mapped out before she was 3. They expected Carrie to go to college and get a professional degree, just like they did. Every step of her education was designed with that goal in mind. Not surprisingly, our Cheerleader upset the apple cart. Carrie was not very good at academics. She was a solid “c” student, much to her parent’s dismay. She didn’t care about what she termed “useless” subjects like algebra and ancient history. She cared about art, and music, and funky clothes and time with her friends. Because Carrie is a good hearted, loving child she worked hard and did make it into college as her parents wished. She even took business courses, because all her life she had been brought up to believe that was the only “right” career path. But her real love was the theater department. She spent all her free time there, working on sets, designing costumes, making posters and, the greatest joy of all, actually performing. After college Carrie got a job at a big insurance company and began the cubical life. She always felt vaguely out of place though, like a flamenco dancer at a formal ballroom dance. Because she had some Coach-like leadership skills, plus some of the Team Player’s ability to instinctively read people, she got along well, everyone loved her at work. But it just didn’t fit. After learning about personality types, Carrie realized she was created to be outgoing, imaginative and buoyantly gregarious. She understood that her parent’s more restrained view of the world was only one way to live, not the only “right” way. More importantly, she come to the revelation that she was not flawed, she wasn’t missing a self-control gene or anything else. She was living a poorly fitting life. Her current job didn’t allow her to use many of her natural gifts and constantly required her to use strengths in the opposite, Manager, personality. Cheerleaders are quick decision makers and Carrie didn’t hesitate. When the local theater company advertised for a production manager, she was the first one to apply. She got the job and three weeks later said goodbye to the cubical farm. The new position hasn’t the high income of her former job, it doesn’t have the status of a corporate executive, and her parents were strongly opposed – once they found out. Carrie forgot to mention the change until almost a month after she had switched jobs. She quickly settled into her new lifestyle and adapted to the changes with the ease of a Cheerleader. Sanguine Cheerleaders are the fuel for the world’s engine, they light us up, they burn bright and hot and occasionally need a little containing, but without them world would be plain gray.